Egypt's President Abdel-Fattah El-Sisi received a phone call from his Somali counterpart President Mohamed Abdullahi in which he praised Cairo's support for Mogadishu's efforts to restore order and stability in the country, El-Sisi's office said in a statement. The two leaders discussed recent developments in Somalia as well as the Somali government's efforts to restore stability in the war-torn country, where the central government in Mogadishu has for years been battling an insurgency by the Al-Qaeda-linked Al-Shabaab group. Al-Shabaab has carried out numerous terror attacks in the capital and in other parts of Somalia, leaving hundreds dead or injured. Egypt has regulary sent Somalia humanitarian assistance and medical supplies in response to the country's droughts and terrorist attacks. During the phone conversation, El-Sisi stressed "Egypt's continued support for the unity of Somalia, expressing Egypt's keenness to continue to enhance various aspects of bilateral cooperation between the two countries." The Egyptian president also said Egypt will continue to provide "technical support to the people of Somalia and back them in their efforts to build the institutions of their country and to establish security and stability," the statement said. 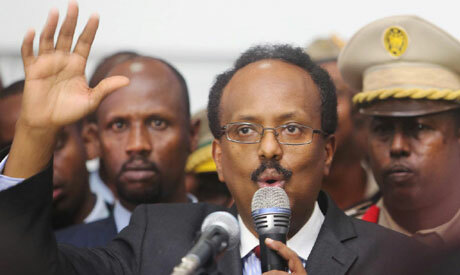 The Somali president said the two countries will continue their ongoing cooperation to combat terrorism. Abdullahi visited Cairo last August in a trip during which he discussed with El-Sisi mutual ties and cooperation.